Many women, once they find out they're pregnant, worry about the behaviors in which they engaged during early pregnancy. One of the most common concerns in mothers-to-be is that alcohol consumed before they found out they were pregnant will hurt the baby. In general, while you shouldn't drink if you know you're pregnant, red wine you drank before you found out about the pregnancy won't hurt the baby. Very early pregnancy encompasses several distinct developmental phases. The first two weeks of pregnancy actually occur before you even conceive, explain Heidi Murkoff and Sharon Mazel in their book "What To Expect When You're Expecting." The next two weeks -- weeks three and four of pregnancy -- are a sensitive time in development during which the fertilized egg begins to divide and implants in the uterine lining. During weeks five through eight, most of the organ systems develop. The concern regarding alcohol use during pregnancy is that it can lead to developmental defects, including physical and mental disabilities. The March of Dimes explains that routine alcohol use during pregnancy leads to a spectrum of disorders called Fetal Alcohol Syndrome. While most commonly observed -- and observed to the greatest degree -- in babies born to women who drank habitually and heavily during pregnancy, no amount of alcohol is considered safe by the medical establishment while you're pregnant. Most women don't test positive for pregnancy until at least the end of the fourth week, note Murkoff and Mazel. While alcohol use during the first two weeks of pregnancy -- the time during which you haven't actually conceived -- isn't a problem, you may be worried about red wine that you drank during weeks three and four. Most obstetricians agree that there's very little likelihood that this alcohol, whether it's red wine or another type of drink, will damage the baby. Once you know, or even suspect, that you're pregnant, it's best to avoid all alcohol. This is true for red wine as well as other types of spirits. The reason is that even though there's little evidence to suggest that small amounts of alcohol during pregnancy -- early or otherwise -- will hurt the baby, there's no amount of red wine or other alcohol that's been proven safe, explain Murkoff and Mazel. 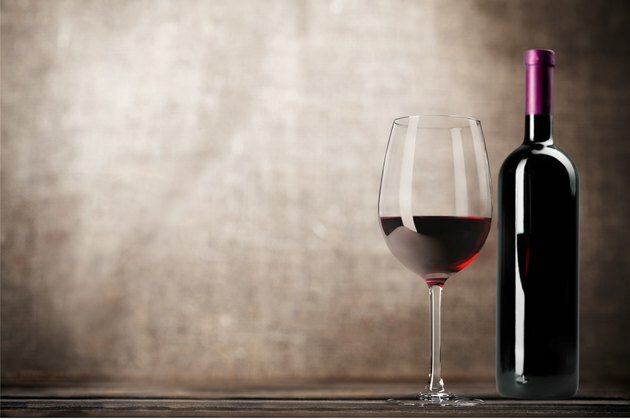 It's best to be safe, and avoid red wine entirely once you have a positive pregnancy test. Is Vodka Sauce Safe for Pregnant Women?